On June 2nd, I left Lancaster, Pennsylvania, to join Energy Justice Summer; a joint project with the Energy Justice Network & SustainUS. Over the next ten weeks, I’ll be a part of a project that hopes to expose the dangers of shale gas extraction, aka “fracking”, in addition to studying the direct impacts it has on small town economies and environments. I’ll be writing reports and news articles (like this one) as well as interviewing townspeople who’ve seen the detrimental effects of shale gas extraction firsthand. 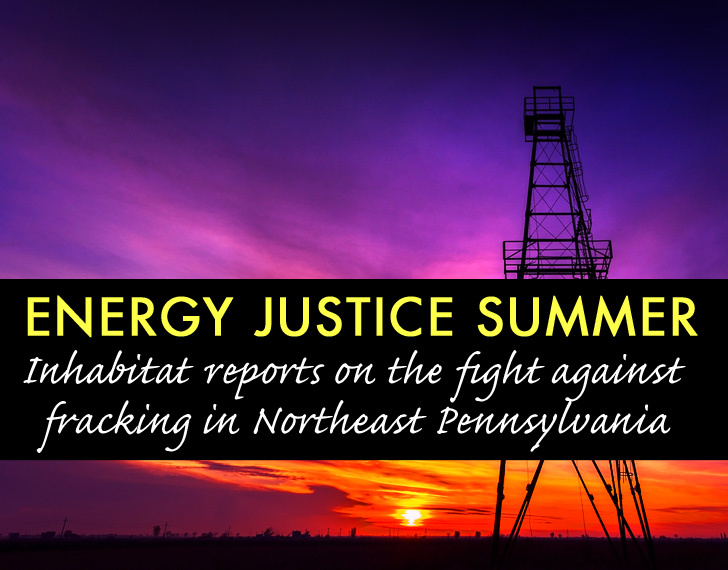 Our hope for this project is that the people reading these reports will realize President Obama’s “all-of-the-above” energy policy is disproportionately affecting the poorer populations who live in these shale fields and areas of extraction and production. This realization will result in an awareness of the issue and policy changes to ensure similar environmental and social justice issues are solved and avoided in the future. It’s weird knowing that I left a place I called home for the past four years in exchange for a farmhouse of new friends and spotty cell phone reception. Usually, entering a new place is exciting for me, but in a town where many of the residents support shale gas extraction and rely on the fossil fuel industry for employment, I realize that for the first time in my life, it could be dangerous for me to stick out too much. It’s not so much an issue of people disagreeing with me or thinking my tactics are radical, because at a liberal arts college in conservative Lancaster I sure got a lot of that. But it’s important to keep in mind that by opposing the shale gas industry I am directly interfering with these peoples’ livelihoods and futures. That said, Energy Justice Summer’s goals include charting a path to a just transition for a clean-energy economy. Such a transition would allow town members to obtain equally paying clean energy jobs, referred to as “Green-Collar Jobs” by Van Jones, author of The Green Collar Economy and founder of Rebuild The Dream; a 21st century “think tank” that focuses on inventive solutions to fix the U.S. economy and “uplift” the next generation. Fighting this problem from the sidelines has thus far been cushioned, preventing me from seeing the horrors that shale gas extraction truly unleashes on the lives of those it affects. Many of these problems such as drinking water contamination and earthquakes are results of drilling, frack-fluid injection, and lack of regulation that allows the fossil fuel industry to cut corners to save a quick buck. On the front lines, I won’t have drinkable tap water and I’ll be in the “frack fields” of rural Pennsylvania, fighting an extraction I’ve disagreed with since Josh Fox came to Franklin & Marshall College’s campus in Lancaster my sophomore year and showed the popular documentary “GASLAND“, inspiring me to become a joint major in environmental studies and creative writing. 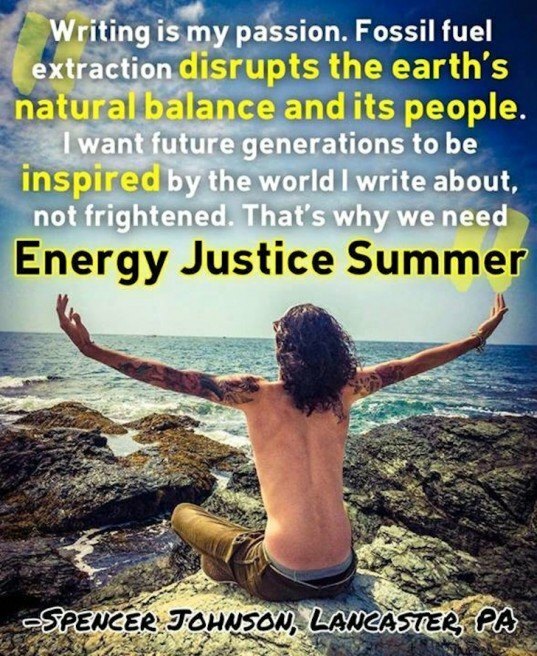 Working on this Energy Justice Summer project will allow me to fully appreciate the life I am fortunate enough to live, away from the environmental damages our fossil fuel-addicted lifestyles create. In addition, it’ll mean dealing with those damages firsthand and interacting with policymakers and townspeople who have the power to raise their voices and make this societal shift a reality. I hope my involvement and documentation of this experience will encourage others to join in the fight against the dangerous and extractive processes that are ruining the future of this wonderful planet we all call home. We haven’t known of any other way to live our lives, but soon, my wish is that we will pass this time of fossil fuels and rely entirely on renewable energy technologies that will provide clean energy jobs for a clean energy economy that future generations deserve and need. It’s time for me to step outside my comfort zone, to carry my home on my back, to fight for a safe and sustainable future. I look forward to the experiences, the friends, and the opportunities I will have in the months to come. 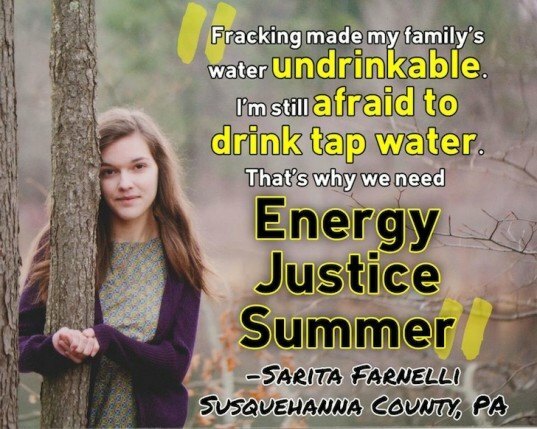 Fracking and related infrastructure is something we should all know more about and discuss. The time is now. We are the change we wish to see in the world. That’s why we need Energy Justice Summer. Stay tuned for more posts about this Energy Justice Summer endeavor! Photos by Collin Rees, Timothy Garlington, & Rima Brindamour; lead photo via Shutterstock. The photo of Sarita is by Rima Brindamour...it's Sarita's senior picture. 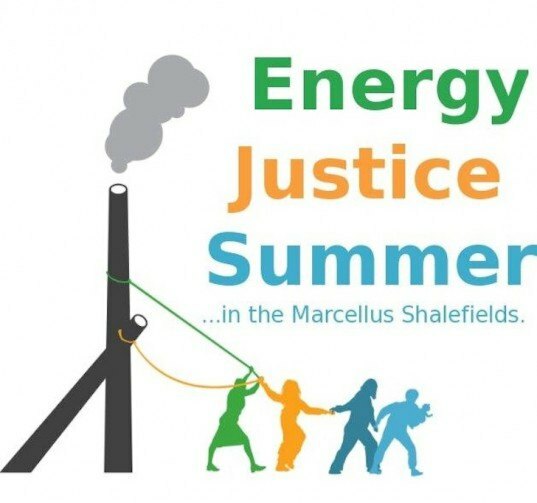 On June 2nd, I left Lancaster, Pennsylvania, to join Energy Justice Summer; a joint project with the Energy Justice Network & SustainUS. Over the next ten weeks, I'll be a part of a project that hopes to expose the dangers of shale gas extraction, aka “fracking”, in addition to studying the direct impacts it has on small town economies and environments. 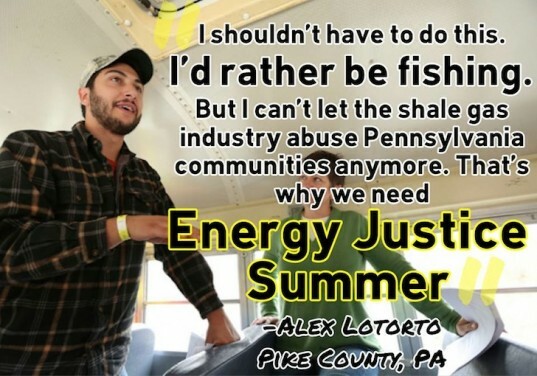 I'll be writing reports and news articles (like this one) as well as interviewing townspeople who've seen the detrimental effects of shale gas extraction firsthand.